Lyndon Gardner gained his A.R.C.M. diploma in 1983 and studied music as a mature student at the Welsh College of Music and Drama in Cardiff. 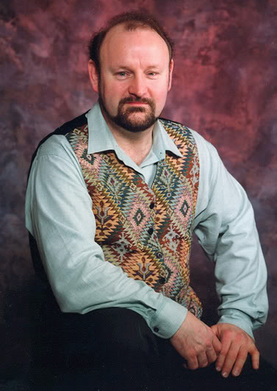 A Welshman, now living in the Midlands, he is an experienced lyric tenor soloist performing on the stage, in concerts and a wide variety of Oratorios throughout the country and more recently abroad, who has developed an enviable reputation as an intelligent tenor of genuine quality, with stage presence, musicality and an educated sense of style. Lyndon appears regularly as an Oratorio soloist and his extensive repertoire includes works by Francisco Valls, Montiverdi, Schütz, Steffani, Purcell, Bach, Pergolesi, Handel, C.P.E. Bach, Mozart, Haydn, Beethoven, Schubert, Mendelssohn, Rossini(inc. Stabat Mater and Petite Messe Solenelle), Dvorak, Verdi (inc. Requiem), Puccini (inc. Messa di Gloria), Elgar including The Dream of Gerontius, Finzi, Vaughan-Williams, Carl Orff, Britten, Stravinski, Tippet and Paul McCartney/Carl Davis' Liverpool Oratorio. With his excellent sight singing skills, extensive and varied repertoire, he is at home in all styles of music including the avant-garde and is a reliable and proficient late substitute performer. On the stage, Lyndon's roles include Ormindo, Tamino, Ferrando, Don Ottavio, Count Almaviva (Barber of Seville), Florestan (Fidelio) Nemorino, Alfredo, Radamès, Ricardo (Un Ballo in Maschera), Eisenstein and Alfred (Die Fledermaus), Hoffmann, Camille (Merry Widow), Rodolfo, Cavaradossi, B.F.Pinkerton, Turiddu, Canio, Don José and Remendado (Carmen), Pang (Turandot) and Beppe (I Pagliacci), in addition to other roles in the operas of Bellini, Massenet, Weill, Menotti, Britten (incl. Albert Herring). His Gilbert and Sullivan roles include The Defendant, Ralph Rackstraw, Frederick, Nanki-Poo, Marco, Alexis, Richard Dauntless and Captain Fitzbattleaxe. He is principal tenor with 'operahouse' and the contemporary, electronic/interactive 'Solid State Opera', with which he toured the Midlands in the role of the Flight Engineer in the World Premiere of Pip Greasely's 'The Last Broadcast'. Lyndon was a choral scholar to the 'Leicestershire Choral Scheme' for six years, tenor soloist with the 'Midlands Chorale' for four years and a member and tenor soloist for the renowned Chamber Choir the 'New England Chorale' under the direction of Philip Gilbert. He made his BBC Radio debut in 1978 and his first performance on television in the World Premiere of the 5K Pursuit Opera broadcast on Channel 4 TV in June 1992 and as part of the San Francisco Golden Gate Festival the following year. Lyndon has been selected to take part in numerous first performances including the World Student Premiere of Stravinski's Les Noces whilst at the Welsh College of Music and Drama, the first modern performances of Santa Pelagia and San Giovanni Battista by Stradella, and Colonna's Il Mosé, Legato di Dio for the musical academic Victor Crowther at Loughborough University. In 1998 Lyndon performed the role of the Spirit of the Stoneplant in the World Premiere of the major outdoor/interactive installation operatic venture Out of the Blue for the Seachange Trust at Great Yarmouth, directed by Hilary Westlake with music composed by Pip Greasley. Recent major performances include Florestan in Fidelio for operahouse, concert performances at Buxton Opera House and Derby Theatre, Carmina Burana with the Southport Bach Choir, Mozart's Requiem and Vespers with the Welsh Philharmonia Orchestra in South Wales, the role of Gerontius in the Dream of Gerontius and Paul McCartney's Liverpool Requiem with the Edwin James Festival Chorus and Orchestra in Littlehampton, and the title role in the world premiere of the contemporary opera Ivanhoe by John Middleton, and the role of Jesus in the World Première of the same composer's St John Passion. As tenor soloist with the New England Chorale, Lyndon toured Normandy at the 2014 'Caen Summer Music Festival' and in a tour of the East of England sang at Harwich, Hadleigh, Lavenham and Bury St. Edmund's Cathedral in 2015. Future plans include Handel's Messiah, the recording of a double CD of 32 songs by Francesco Paulo Tosti and the role of Jesus in the World Première of John Middleton's 'The Word' in 2018. Lyndon has had the privilege of participating in master-classes with Constance Shacklock, Donald Adams and Robert Williams and a study weekend with Nina Walker and Phillip Gregson of the Royal Opera House Covent Garden. He studied briefly with Hervey Alan at the Royal College of Music and with Ian Partridge before more lengthy study with the Australian operatic tenor Arthur Solomon, with Brian Burrows whilst at the Welsh College, and extensively with the bel canto baritone Gwyn Griffiths a student of Alessandro Pius, and most recently with the bel canto tenor David Maxwell-Harrison, a student of Ettore Campogalliani in Mantova. Whilst still fully involved as a performer, Lyndon is now a vocal coach himself and is enjoying the challenge of sharing the knowledge gained through his previous mentors and his wide and varied experience to a new generation of performers. "Lyndon Gardner's keen edged tenor was often thrilling as in the Rex Tremendae." "Lyndon Gardner's tenor was musical and expressive." "Nemorino, superbly played by Lyndon Gardner with his subtle human touches and silky smooth sounds, played both the lovelorn victim and comic hero with great effectiveness." "Lyndon Gardner has the knack of swift and vivid character-drawing." "Lyndon Gardner coped magnificently both on the dramatic and operatic side." "Lyndon Gardner as Alfredo gave a performance full of subtlety and changing tone colours, alternatively aggressive, reflective and especially tender in the Act 3 duet "Parigi o Cara" with Violetta." "It is amazing to hear your terrifyingly real Ivanhoe - which is totally true to my original conception"
John Middleton, The composer Ivanhoe. "Among the men, only Lyndon Gardner appeared physically at ease, but he is a complete performer."